I am tutoring a fourth grader who is a reluctant reader. After we happily zoomed through Raina Telgemeier's graphic novel versions of The Babysitter's Club series, we hit the library together to find our next books. As soon as my friend saw the Fashion Kitty series, she had them all scooped up for our next few sessions. 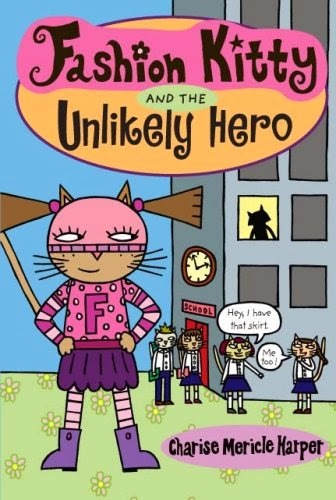 A simple but cute story of a superhero kitty, Charise Mericle Harper's heroine gets called whenever there is a fashion emergency. In this book, there are suddenly many emergencies when Kiki Kitty's principal bans fashion and orders everyone to wear a uniform. On top of that, Becky is wearing socks with flip flops, something that causes Kiki to want to solve the mystery of why anyone would do that. For me, the mystery felt a bit weak, but my charge was engrossed and making guesses throughout the book. Engaging for girly girls, it is also a quick read that had my friend proud to have finished the entire book in 45 minutes. I would consider adding the series to my classroom's shelves for the incoming sixth graders who need to transition from elementary to middle school with some safe and easy reading.